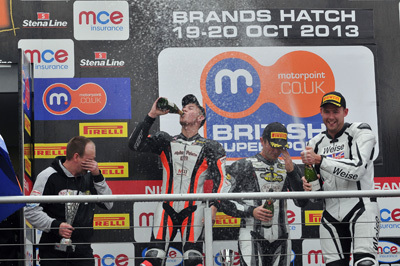 TEENAGER Josh Corner celebrated his first Motorpoint British Supersport Cup podium after crossing the line second in a dramatic season finale at Brands Hatch. The 16-year-old, from South Shields, finished 11th overall in only his third race in the high-profile championship. Corner and his family-run team made the step up to the fierce 600cc championship in September after starting the year running in the Pirelli National Superstock 600 Championship, both of which run as part of the support programme for the prestigious British Superbike Championship. After crashing out of his first event at Assen just over a month ago, he was denied a finish last time out at Silverstone due to a mechanical problem with his Kawasaki ZX6R.